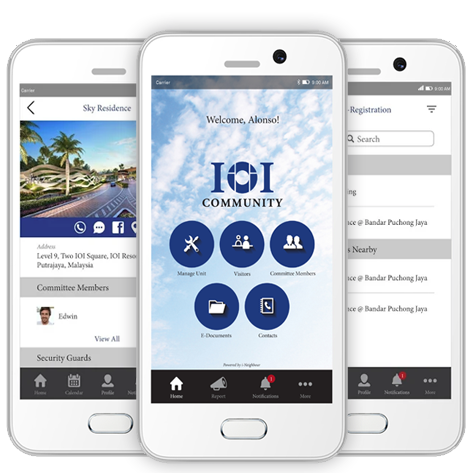 IOI Properties Group Berhad (“IOIPG”) has recently created an online community engagement platform via its mobile app, which is known as IOI Community. This App is being powered and developed by our Smart Community Solution, i-Neighbour, that is designed to ease the visitor management system as well as the residential management of high-rise buildings and gated guarded communities. With it, IOIPG can focus on fostering sustainable community relations and creating an environment that is conducive for working, playing and living within its development. As stated by Lee Yoke Har, IOIPG Executive Director, “Our ultimate aim is to provide convenience, speedier and more personalised communication, and service delivery platform that will meet the energetic lifestyle of the urban community”. Through IOI Community App, residents can have access to features such as e-billing, facilities booking, defect reporting, announcements and many more, all right from their smartphone. The App is currently available for the communities of Clio Residences, Sierra 6 and Almyra Residences with plans to include other developments such as Conezion, N’Dira and Sky Condominium in the next two months. i-Neighbour is a product that is entirely made in Malaysia by Malaysians and it’s great to see that our product is being supported by one of Malaysia’s leading public-listed property developers. To know how i-Neighbour can promote smart community explore i-Neighbour website.